The Eternal Enemy contains elements of horror, but could just as easily be classed as a science fiction story. Like most of Christopher Pike’s books it is not particularly long and, at just 167 pages, it’s probably more of a novella than a novel. 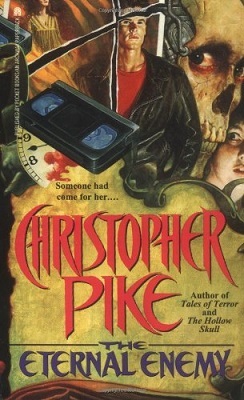 The book does seem a little longer at first glance, however, due to the inclusion of the first chapter of Pike’s book The Immortal, which adds an extra 25 pages. The Eternal Enemy is written in the first person. The central character is an eighteen-year-old girl called Rela. Her name might be a little on the unusual side, but Rela’s tastes are all very normal. She likes beautiful clothes and loud music, long talks on the phone, cookies, and boys. Her favourite cookies are chocolate chip and her favourite boy is Christopher Perry. Rela is an extremely intelligent girl, but when it comes to Chris she is as shy as she is smart and cannot pluck up the confidence to approach him. Rela is planning a party and, if she can pluck up the confidence, she intends to invite Chris, but gathering the courage to ask Chris to her party is only one of her problems. Rela’s other worry is the entertainment: she needs a VCR. Fortunately, Rela has a part-time job at the library and has managed to save up two hundred dollars, so she should be able to afford that much-needed VCR. The only trouble is the guy at the shop tells her that a two hundred dollar machine will not be much good. He insists that she will need a machine that has four heads instead of two; two just will not do, and so, taken by her good looks, Ed cuts Rela a deal and sells her a three hundred and forty dollar machine with a sixty dollar discount and accepts a postdated cheque for the extra eighty. Rela has not had her VCR very long when she discovers something rather strange about it—the VCR can tape the future, so tomorrow’s news is only ever the touch of a button away. The ability to video the future proves to be as much of a curse as it is a blessing. On the one hand Rela knows which football team will win the game and so all of the gamble is removed from gambling and she is sure bet winner every time. On the other hand though, when she sees catastrophes on the news she feels a duty to help prevent them from happening. Everything else pales to insignificance when Rela watches the news of her own death and discovers that she will be brutally murdered in just two days time. As far as I know, most of Christopher Pikes books are written for the young adult market. I cannot honestly call myself a young adult and have not been able to do so for quite a while (decades). In most cases, however, this does not stop me from enjoying Pike’s books, because they don’t always come across as being written for a younger reader. The Eternal Enemy is one that does—to me anyway. It is a decent story and there is a lot more happening in it than meets the eye, but I have to admit that I didn’t enjoy the book very much. It’s okay, and I think that any ‘young adult’ who likes reading science fiction horror stories will probably enjoy the book, but I don’t think that this one works as well for older readers because it is rather hard to identify with the characters and the language used. All in all, the way the story is presented has too much of a ‘young’ feel to it.